We’ve all had that really bad day with vomiting caused by the stomach flu, a night of heavy drinking, or that leftover pizza you knew you shouldn’t have eaten because you couldn’t remember when you last ordered pizza, but you ate it anyway. If you’ve been around babies or young children, then you’ve more than likely experienced it. But, was that vomiting actually projectile vomiting? Think of this article as your complete guide to projectile vomiting. From the projectile vomiting definition to projectile vomiting causes and projectile vomiting treatment, this is your one-stop place for all your answers to any questions you have about this type of vomiting. We’ll even take a quick look at projectile vomiting in babies versus projectile vomiting in adults. Here is everything you wanted and didn’t want to know about projectile vomiting. So what exactly qualifies as projectile vomiting? Is it just a little bit of force while you throw up, or does it have to be coming out of you at the same pressure as a fire hose? Essentially, it’s when you vomit in a gushing manner. 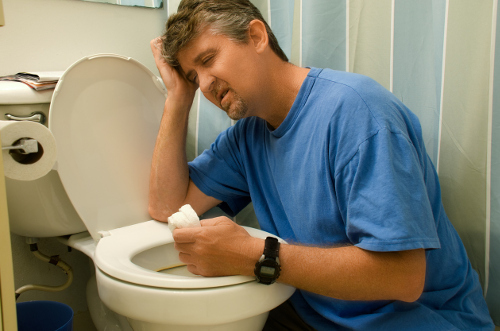 Projectile vomiting also tends to come in short, violent bursts as opposed long, drawn out vomiting. While you may have some nausea before it begins, there is a good chance that projectile vomiting will occur with little to no warning signs. However, if the do signs occur, you will get the signs and then quickly move to the vomiting stage. Now that you know what projectile vomiting is, you may be curious as to what causes it. There are a few causes of projectile vomiting that you should be aware of, but one of the first things you may want to know is those causes can differ between babies and adults. Projectile vomiting in infants and children is often the result of a bowel or stomach obstruction, which can be due to things like pyloric stenosis (where the pylorus blocks food from entering the small intestine), Hirschsprung’s disease, intussusception, and malrotation. It can also be the result of something that the child swallowed and is obstructing the stomach. Shaken baby syndrome can also cause projectile vomiting due to spinal damage or the sudden increase in intracranial pressure caused by the shaking. In adults, bowel and stomach obstruction is still a possibility, but other causes for projectile vomiting exist. Peptic ulcer disease, gastric or duodenal polyps, and gallstone obstruction (Bouveret’s syndrome) are all possible causes of projectile vomiting in adults. The ingestion of toxins can also cause the stomach to be irritated, and it will try to expel those toxins via throwing up. Part of the reason excessive alcohol consumption can cause projectile vomiting is that the body often considers alcohol a poison. In rare circumstances, the projectile vomiting may be caused by the mind. In some people, extreme fear, anxiousness, or shock may induce projectile vomiting. Kidney issues that cause a change in blood pH can also trigger the vomiting. Projectile vomiting could result from something as simple as overeating. In all human beings—infants, children, teenagers, and adults—your stomach only has so much room for food. If you exceed that amount of room, you’re possibly going to have projectile vomiting. So, now that you know the causes of projectile vomiting, you’re probably wondering what kind of treatment you should be looking into to take care of it, or even possibly prevent them from occurring in the first place. Don’t worry; we’ve got some options that may help you avoid these uncomfortable situations. So, how do you treat projectile vomiting? As we stated above, it comes with very little warning, so it’s hard to predict. But here are some options that you may want to consider, depending on what’s causing your projectile vomiting. Unfortunately, vomiting is your body’s way of getting rid of something that it feels is bad. Now, if your projectile vomiting is the result of a night of heavy drinking, a stomach bug, or some bad food, you may just have to ride it out. Afterward, just make sure you take care of yourself. Drink plenty of fluids and try to replace any lost electrolytes. Unfortunately, if an infant suffers from pyloric stenosis, the only option is surgery to fix the issue. Luckily, the surgery is relatively routine. If you have an intestinal blockage caused by something you swallowed, the doctor may recommend surgery to remove the object, as it is not passing through your digestive system naturally. Now, regarding prevention, there are a few things to keep in mind. Don’t overeat, know your limit, and stay within that limit to avoid projectile vomiting. To avoid projectile vomiting due to overdrinking, don’t overdrink. And, on the off chance it’s not self-evident, try to avoid ingesting poison. Projectile vomiting is not fun. Nor is it caused by anything fun, with the possible exceptions of drinking too much alcohol or overeating. But hopefully, the next time you feel like you are recreating a scene from The Exorcist, you will have an idea of what’s causing it, and if there is anything that can be done to help yourself out. “Projectile Vomiting | Causes in Babies, Children and Adults,” Health Hype; http://www.healthhype.com/projectile-vomiting-causes-in-babies-children-and-adults.html. “Projectile Vomiting (Children, Adults) Causes,” Phaa; http://www.phaa.com/projectile-vomiting-children-adults-causes.htm. Surekha, “Projectile Vomiting – Causes, Symptoms, Adults, Children, Treatment,” Diseases Pictures, January 25, 2016; http://diseasespictures.com/projectile-vomiting-causes-symptoms-adults-children-treatment/. “Projectile Vomiting,” Hey Doctor; http://heydoctor.org/projectile-vomiting.html.